Often enough, on Alive on South Beach®™, Stewart Stewart and I (Dena Stewart) have mentioned the colorful characters who make Miami Beach … MIAMI BEACH! And whenever possible we have a “CONVERSATION” with them. Well, Robert “Raven” Kraft is a standout. He has been the inspiration of documentaries and books. You see, on January 1, 1975, when Robert was 24 years old, he made a New Year’s Resolution to run eight miles every day. Now 66, he has run for more than 15,300 consecutive days and counting. He has run through eight hurricanes, food poisoning, the Flu, man-o’-war stings, and a bad concussion. His persistence and commitment over the years has attracted more than 2,600 runners from all over the world to run with him. Always shirtless, a black sweatband holding back his longish-black hair, black shorts, one black glove, and gray shoes, they dubbed him Raven. Raven Runners, as they call themselves, come from all walks of life and range from as young as six years old to over 80. Those who finish a run are given a nickname. Among Raven Runners is 34-year-old Laura Lee Huttenbach, nicknamed “White Lightning” who recently published a biography about Robert “Raven” Kraft called Running with Raven. Stewart and I caught up with Raven and White Lightning at the Miami Book Fair. Laura Lee Huttenbach, an Atlanta native, athlete and author, is a graduate of the University of Virginia. She has written about her travels in Africa, South America, and the Middle East. 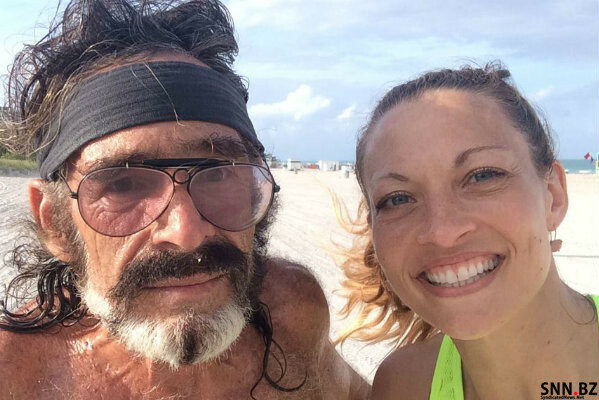 After running more than 1,000 miles with Raven, she was inspired to write Running with Raven. In addition to running every day, Robert “Raven” Kraft is a prolific songwriter.